Rebecca Sears leads the chorus. Tokeneke School recently held its annual winter concert, which included performances by Tokeneke's fifth grade advanced band, fourth and fifth grade orchestra and the fourth and fifth grade chorus. 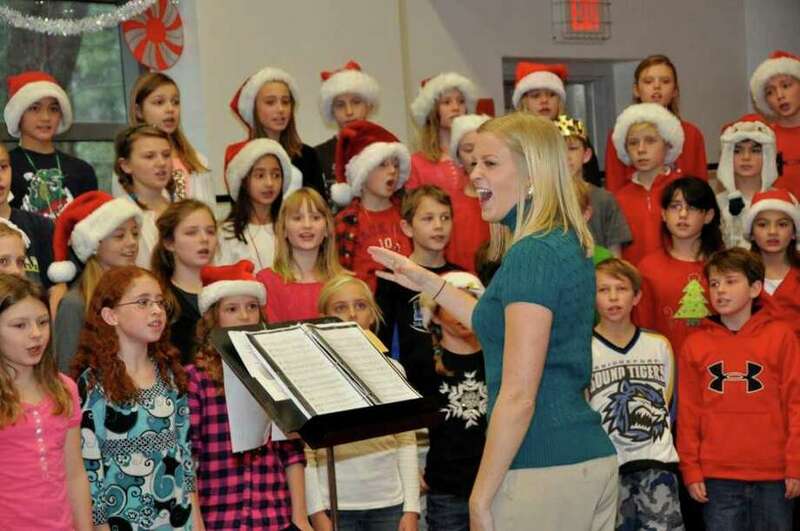 Parents, teachers and students were treated to a variety of holiday songs, some old and traditional. Other numbers were so current and popular that audience joined right in, singing along with the music and tapping their feet to the beat. Both the audiences and the performers donned holiday clothes and had plenty of holiday spirit, as could be seen in the sea of Santa hats onstage. It was a time to get in the holiday mood, celebrate and showcase the students' talent and results of all the hard work the students and their teachers have been doing in music lessons. The band is led by John Macri, the orchestra is led by Dawn Hanley, and the chorus, Tokeneke's biggest ever, is led by Rebecca Sears.